We, the undersigned peace, justice and environmental organizations, and individuals, endorse the following Points of Unity and commit ourselves to working together by forming a Coalition Against U.S. Foreign Military Bases, with the goal of raising public awareness and organizing non-violent mass resistance against U.S. foreign military bases. While we are opposed to all foreign military bases, we do recognize that the United States maintains the highest number of military bases outside its territory, estimated at almost 1000 (95% of all foreign military bases in the world). Presently, there are U.S. military bases in every Persian Gulf country except Iran. In addition, United States has 19 Naval air carriers (and 15 more planned), each as part of a Carrier Strike Group, composed of roughly 7,500 personnel, and a carrier air wing of 65 to 70 aircraft — each of which can be considered a floating military base. These bases are centers of aggressive military actions, threats of political and economic expansion, sabotage and espionage, and crimes against local populations. In addition, these military bases are the largest users of fossil fuel in the world, heavily contributing to environmental degradation. The annual cost of these bases to the American taxpayers is approximately $156 billion. The support of U.S. foreign military bases drains funds that can be used to fund human needs and enable our cities and States to provide necessary services for the people. This has made the U.S. a more militarized society and has led to increased tensions between the U.S. and the rest of the world. 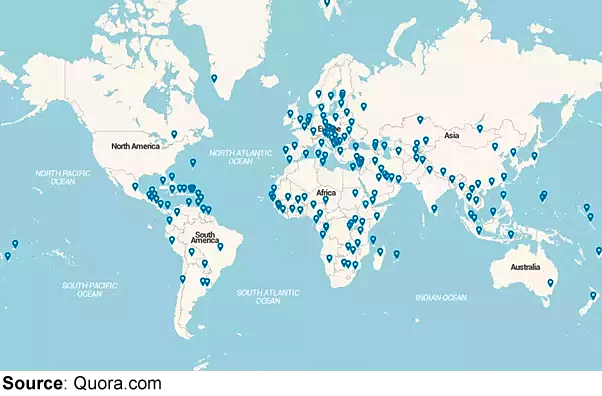 Stationed throughout the world, almost 1000 in number, U.S. foreign military bases are symbols of the ability of the United States to intrude in the lives of sovereign nations and peoples. Many individual national coalitions — for example, Okinawa, Italy, Jeju Island Korea, Diego Garcia, Cyprus, Greece, and Germany — are demanding closure of bases on their territory. The base that the U.S. has illegally occupied the longest, for over a century, is Guantánamo Bay, whose existence constitutes an imposition of the empire and a violation of International Law. Since 1959 the government and people of Cuba have demanded that the government of the U.S. return the Guantánamo territory to Cuba. U.S. foreign military bases are NOT in defense of U.S. national, or global security. They are the military expression of U.S. intrusion in the lives of sovereign countries on behalf of the dominant financial, political, and military interests of the ruling elite. Whether invited in or not by domestic interests that have agreed to be junior partners, no country, no peoples, no government, can claim to be able to make decisions totally in the interest of their people, with foreign troops on their soil representing interests antagonistic to the national purpose. We must all unite to actively oppose the existence of U.S. foreign military bases and call for their immediate closure. We invite all forces of peace, social and environmental justice to join us in our renewed effort to achieve this shared goal. * For identification purposes only. Pingback: US Empire Is Failing, Time To Change Course – Stop the Wars at Home and Abroad!